I still can't believe my little baby is all grown up ... well at least grown up as much as a six year old can be! 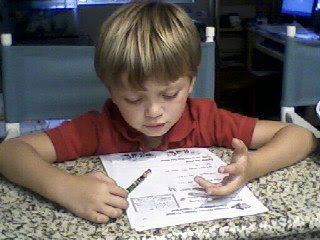 I am so lucky to have a child who is so enthusiastic about his homework. Dylan loves reading and math is his favorite subject in school. Reading I understand, but the math, seriously? This must be a ripple effect from me spending the entire summer taking College Algebra I and II. Dylan is doing great in school so far and of course he has become one of the teacher's favorites. I'm so proud of my little boy!